Seated from the left: Charles Bloomgren, Robert G. Samuelson, Lyle Tapp, George W. Erickson. Standing: Charles Juneau, Fred Cook, Martin Sandburg, Willis Calkins, Oscar F. Larson, Lawrence Futhey, Victor Thurine, Carl Sandburg. 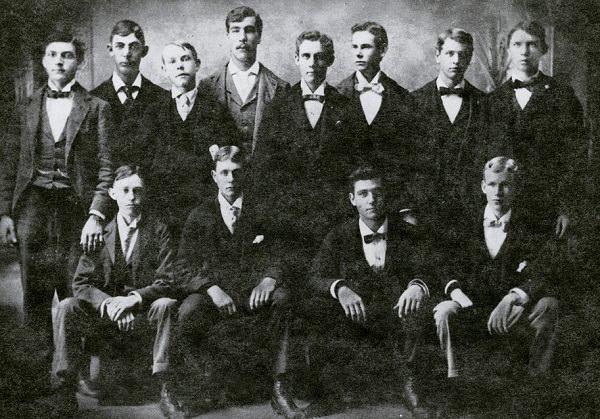 In the photograph of the twelve teenage boys who called themselves the Dirty Dozen, Lawrence Futhey is standing third from right. The photograph was taken in a studio in Galesburg on a Sunday afternoon in the 1890s. Carl Sandburg and his brother Martin are also in the picture. Lawrence Futhey was born May 10, 1879, in the First Ward of Galesburg. His parents were John W. and Lucetta Sapp Futhey. The Futhey family had migrated from Ohio to near Carthage in Hancock County, Illinois. Mrs. Futhey was born near Williamstown, Kentucky, on January 1, 1847. Her family later moved to northern Adams County, Illinois. John was an engineer for the Chicago, Burlington and Quincy Railroad. He had a brother, Charles, who was also an engineer for the railroad and lived in Galesburg. The John Futhey family lived at 122 South Day Street for a number of years and then lived at 623 East Berrien Street. Next, they moved to 168 East Brooks Street. Besides Lawrence, they had a daughter Myrtle. She married Harry E. Gillette and had two daughters. Sadly, she died in 1908. Lawrence's first job with the railroad was as truckman in the front office. By 1900 he had become a fireman for the Q. He later moved to Fort Madison, Iowa, and worked as a locomotive engineer. While there he was married his wife, Jessie. Being an engineer on a steam locomotive was a noisy, hot, dirty and physically demanding job. Practice was required to learn the necessary coordination between the throttle, valve gear and brakes. A steam engine did not respond immediately to throttle or brakes. There might be a fifteen to twenty second delay which the engineer had to learn to judge. The engineer also had to manage the power of the locomotive, coupler slack, momentum and braking of all the cars behind it. He had to factor in the grades, curves and speed as the train moved along the track. The job required a great deal of judgment. Firemen in the steam locomotive days had to light the firebox by tossing in wood kindling with a flaming oil-soaked rag. It could take as long as three hours to build enough steam to pull the train. As the train moved the fireman had to add coal to keep up the proper steam pressure in the boiler, which averaged 150 to 200 pounds per square inch. In the 1920 Federal Census, Lawrence and his wife, Jessie, were living at 5844 South Campbell Avenue in Chicago and he was still a railroad engineer. Jessie Luthey died in 1946. Lawrence was living with his daughter, Mary Louise Ryan, at the time of his death in 1959. The Brighton Park Lodge No. 854, A.F. & A.M. conducted the funeral services. The remains were returned to Galesburg for burial. The family lot in Linwood Cemetery contains Lawrence and Jessie Futhey, his parents John W. and Lucetta Futhey, his uncle and aunt Charles E. and Rozetta Futhey and his sister Myrtle. Lawrence Futhey lived to be almost eighty years of age. He married, raised a family and worked for the railroad for many years. He led a quiet, but responsible life, which many wish could be said of them.